Description of "101 tips to sell your house (eBook)"
Dont pay brokers a big amount for selling your house. A trusted book that will tell you how you can sell your house or real estate yourself and save big money. 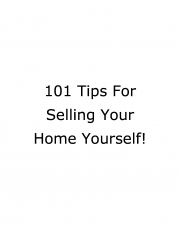 Reviews of "101 tips to sell your house (eBook)"